The truth is that many wrong beliefs are widespread in the world about this wine: too many people, for example, still believe that the typical blend of grapes is Corvina, Rondinella, Molinara. It's not so. This was the traditional blend until 2003; afterwards, the rules of production of Valpolicella DOC (Denomination of Controlled Origin) were modified, and nowadays all the wines in Valpolicella (Amarone included) are made with a blend of three grapes (Corvina, Corvinone, Rondinella) where Corvina is prevalent: from 45 to 95%. Nevertheless, the presence of Corvinone is allowed to the extent of 50% in substitution of the same percentage of Corvina and Rondinella from 5 to 30%. Other local not aromatic grapes like Molinara are simply permitted. Thus, in order to let you know how Amarone della Valpolicella is really made, here there is a small elucidation. Amarone della Valpolicella is made with local grapes Corvina, Corvinone, Rondinella (and often also with addition small amounts of other red not aromatic varieties recommended or authorized for the province of Verona) generally picked (barring anomalous weather conditions) between the last ten days of September and the first week of October. In order to successfully complete the critical phase of "appassimento" (drying process), the fruit must be fully ripe and in perfect condition, therefore the fruit selection in the vineyard is very accurate. 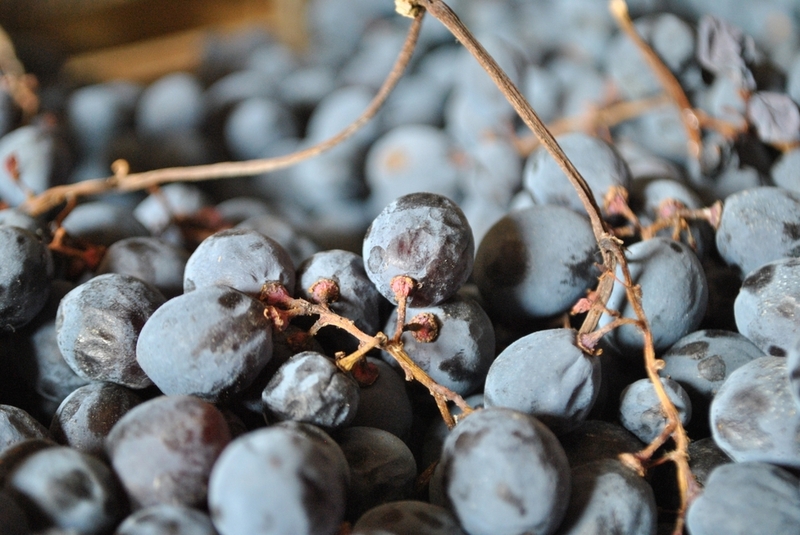 Once picked , the grapes are laid out carefully in a single layers, to allow air to circulate around the bunches, in either wooden or plastic trays or on bamboo cane mats and placed in special drying rooms (called fruttai) located generally over the wine cellars, or in some building on the hills. These rooms are large and airy, to ensure the condition necessary for perfect drying. In particularly adverse weather conditions, which may threaten the development of the bad form of mould Bothrytis cinerea - I mean the grey form - it is sometimes necessary to make use of air conditioning to reduce humidity levels inside the drying rooms. Nowadays, almost every wine producer has an aeration plant, and many of them also a remote electronic temperature control. 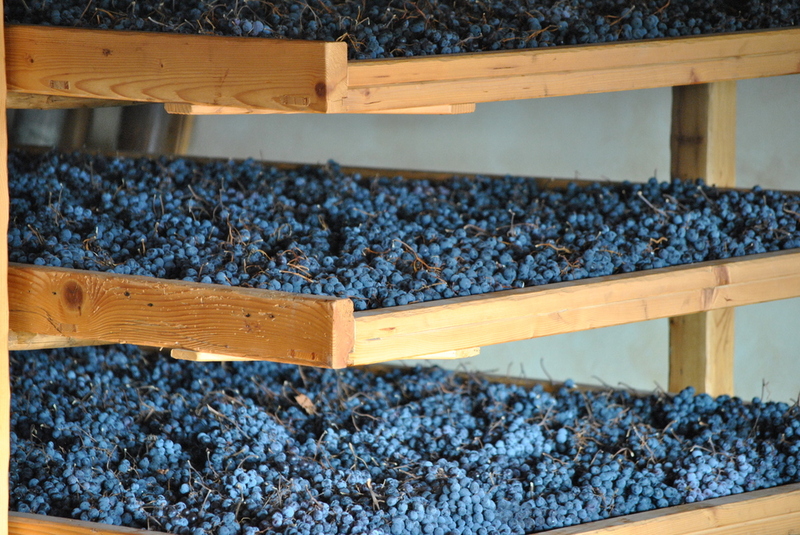 The grapes remain in the drying rooms for three to four months. During this period their condition is continually monitored: any infected grapes are removed immediately. Meanwhile many changes take place inside the grapes: a reduction in the level of acidity, loss of water, concentration of many substances (sugars, polyphenols), a significant increase in the amounts of glycerine and other components such as resveratrol, to which authoritative international research has attributed the beneficial effects of moderate wine drinking. Once the period of drying is completed, the grapes are crushed. In Valpolicella, today two approaches to vinification exist side by side. The more traditional one involves long fermentation at the low natural cellar temperatures of January and February and a period of maceration which may last several months. In the more modern approach, wines are vinified in multi-functional vats which allow the producer to control temperatures, break up the cap and stir the skins in the must with the overall objective to making a softer style of Amarone with distinctive fruit character, which can be enjoyed after a shorter period of aging. Whatever the style of vinification, Amarone undergoes a period of a natural aging in wood which may be in larger Slavonian oak barrels, or in the French barriques. This is the process for making Amarone briefly described: in fact, if you visit many different wineries in Valpolicella you can observe also many different details, technical choices or tricks that contribute making every Amarone della Valpolicella an absolutely unique and inimitable wine in the world. In our next posts we'll try to reveal some of these secrets of the craft.